This book reveals reveal how a secret cabal of influential “Venus” families with a lineage tracing back to the Eleusinian Mysteries has shaped the history of the United States since its founding. The evidence for such incredible assertions comes from American institutions such as the National Grange Order of Husbandry and from the man-made landscape of the United States where massive structures and whole cities conform to an agenda designed to elevate the feminine within religion and society. The authors explain how the Venus families, working through the Freemasons and later the Grange, planned the American Revolution and the creation of the United States. It was this group who set the stage for the Founding Fathers to create Washington, D.C., according to the principles of sacred geometry, with an eye toward establishing the New Jerusalem. The authors explore the sacred design of the Washington Monument, revealing its occult purpose and connections to the heavens. They reveal how the obelisks in New York City depict the stars of Orion’s Belt just like the Giza pyramids and how the site of one of them, St. Paul’s Chapel, is the American counterpart to Rosslyn Chapel in Scotland. Exposing the strong esoteric influences behind the establishment of the Grange in the United States, they connect this apparently conservative order of farmers to the Venus families and trace its lineage back to the Cistercians, who were a major voice in the promotion of the Crusades and the establishment of the Knights Templar. 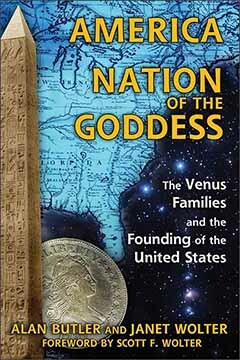 AMERICA: NATION OF THE GODDESS: The Venus Families and the Founding of the United States By Alan Butler and Janet Wolter 368 pages. 6x9 Paperback. Illustrated. References.